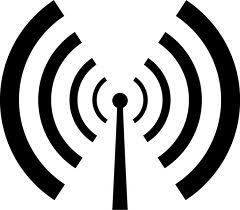 Cell phones use radio waves to communicate. Radio waves transport digitized voice or data in the form of oscillating electric and magnetic fields, called the electromagnetic field (EMF). The rate of oscillation is called frequency. Radio waves carry the information and travel in air at the speed of light. 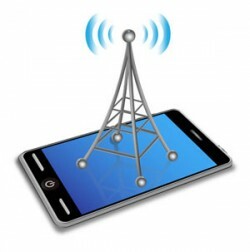 Cell phones transmit radio waves in all directions. The waves can be absorbed and reflected by surrounding objects before they reach the nearest cell tower. For example, when the phone is placed next to your head during a call, a significant portion (over half in many cases) of the emitted energy is absorbed into your head and body. In this event, much of the cell phone’s EMF energy is wasted and no longer available for communication. Cell phones contain at least one radio antenna in order to transmit or receive radio signals. An antenna converts an electric signal to the radio wave (transmitter) and vice versa (receiver). Some cell phones use one antenna as the transmitter and receiver while others, such as the iPhone 5, have multiple transmitting or receiving antennas. An antenna is a metallic element (such as copper) engineered to be a specific size and shape for transmitting and receiving specific frequencies of radio waves. While older generation cell phones have external or extractable antennas, modern cell phones contain more compact antennas inside the device thanks to advanced antenna technologies. It’s important to understand that any metallic components in the device (such as the circuit board and the metal frame for the iPhone) can interact with the transmission antenna(s) and contribute to the pattern of the transmitted signal. Many modern smart phones also contain more than one type of antenna. In addition to the cellular antenna, they may also have Wi-Fi, Bluetooth and/or GPS antennas. As mentioned earlier, a cell phone is a two-way wireless communication device and needs both the inbound signal (reception) and the outbound signal (transmission) to work. 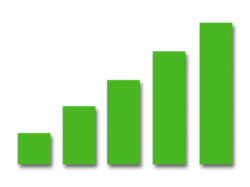 The magnitude of the received signal from the cell tower is called the “signal strength”, which is commonly indicated by the “bars” on your phone. The connectivity between a cell phone and its cellular network depends on both signals and is affected by many factors, such as the distance between the phone and the nearest cell tower, the number of impediments between them and the wireless technology (e.g. GSM vs. CDMA). A poor reception (fewer bars) normally indicates a long distance and/or much signal interruption between the cell phone and the cell tower. In order to conserve battery life, a cell phone will vary the strength of its transmitted signal and use only the minimum necessary to communicate with the nearest cell tower. When your cell phone has poor connectivity, it transmits a stronger signal in order to connect to the tower, and as a result your battery drains faster. That’s why good connectivity not only reduces dropped calls, but also saves battery life.